One of the hottest issues today is the need for alternative forms of energy and one of the possible replacements for oil based and carbon based fuels is solar energy. You can enjoy the benefit of solar energy right in your own yard by using solar lights. Since most outdoor lighting is for accents or security lighting, solar lights are a great choice because they use a softer light source known as LEDs rather than a harsh incandescent bulb. In addition, many people feel it is wasteful to light areas of your home that are not in use during hours when you are mostly asleep. Therefore, since solar lights do not use any electricity that you have to pay for or electricity that comes from a local grid, the use of them is not wasteful. Most people have the basic idea about how solar lights work because they assume that the lights are powered by sunlight. That is essentially true, but there is a little more to it than that. Photons of sunlight cause electrons in the silicon plates of a solar collector panel to move about creating electric current which is turned into electricity. So, basically a solar collector panel turns sunlight into electricity. The electrical energy is then stored in rechargeable batteries for use when it is dark. 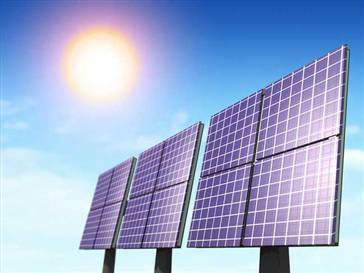 Generally the solar collector panels will work during daylight hours collecting electrical energy. Just normal daylight conditions, without severely sunny conditions will charge the batteries somewhat. For most climates, a typical day will charge the batteries enough so that the lights will burn for up to ten hours. The more the batteries are charge the brighter and longer the lights will shine. A typical solar light is equipped with an LED or light emitting diode. It is not a light bulb, but rather an electrical component that emits light as it conducts current. LEDs do not burn as bright or harshly as an incandescent or halogen bulbs. An LED is roughly the equivalent of a 2 watt light bulb so it is common to have several LEDs in each solar light fixture. 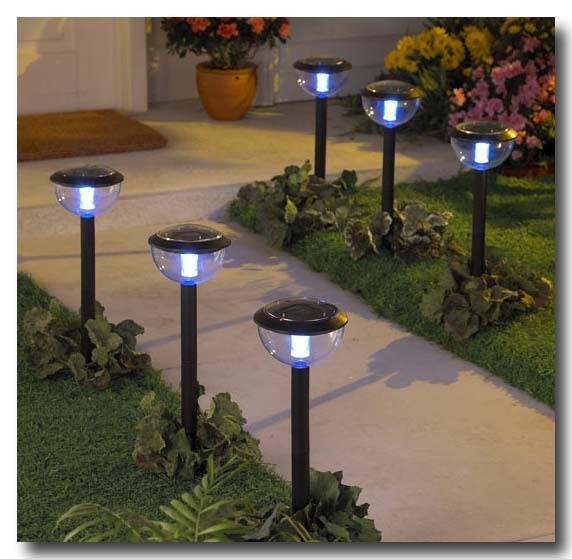 Outdoor solar lights come in many different shapes, sizes, styles, and applications. One of the most common is solar path lighting. If you have a walkway from your driveway to your front door, then it is common to line that walkway with small lantern outdoor light fixtures to light the path. Solar lantern lights work well here because they do not give off a bright light that would be distracting to passing cars or inside the house, but rather they give off just enough light to let you know where the path is. Most solar path lights come with a pointed spire on the end so that you can stick it in the ground easily. 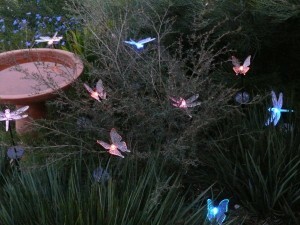 Another common use for this technology is solar garden lights. Decorative solar lighting or garden lighting, again, is just for accenting a particular part of the garden or to give a small amount of light to people who may be approaching your front door. Many solar garden lights come disguised as garden statues or rocks. The statues can be of anything, but frogs, birds, insects, or favorite collectibles are common. The rock lights are meant to blend in so that they are not as noticeable during the day. Some homeowners use solar security or flood lights. 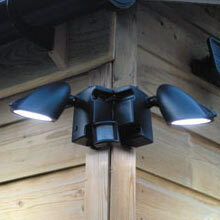 This variety of outdoor lighting usually works on a motion sensor so there is not a bright light on all the time. These lights are typically mounted at the roof line, perhaps just under your gutters. A popular place to have them is at the front door, near the garage, or near any other possible entrance to your home. There are many advantages to using solar light outdoors. First, there is a cost savings. You will not have to pay for the electricity to run the lights as you would with normal outdoor lighting. The energy for solar lighting is completely renewable and independent of the local electrical grid. In addition, the LEDs are not like light bulbs that need to be replaced often. You need heavy duty work gloves to change hot light bulbs on normal outdoor light, but no part of a solar light gets hot to the touch. The life expectancy of an LED is around twenty five years assuming it runs for approximately ten hours per day. The only part of solar lights that need to be occasionally replaced is the rechargeable batteries that only last about one thousand charges or more than two and a half years. Other than that, the maintenance can be limited to occasionally wiping down the solar collecting panel which you can do while completing your biannual gutter cleaning. Alternatively, you can rinse the solar collecting panels with a garden hose. A third choice is to let professionals who are already at your home take care of cleaning and repositioning your solar light collecting panels. For example, the roofing service that comes to do yearly maintenance can take care of it. Another advantage is that there are no cords to run or hide. Other forms of path lighting or security lighting require cords to be run to electrical outlets. This severely limits where you can put your outdoor lights because you need to be able to reach the nearest outlet but still hide the electrical cords effectively. Many homeowners take time to bury the cords, but you always run the risk of animals damaging the cords and having to replace the entire setup. Finally, you do not need to worry about turning the lights on or setting a timer to turn them on at the appropriate time. Most solar lights have a small photocells built into them that detect when there is a decrease in ambient light. Therefore, at dusk the lights will automatically turn on and when the sun comes up they will automatically turn off. Hopefully after considering all of these solar energy facts you will consider using solar lights in your yard or garden.